Slicing through the sky in Utah's Arches National Park, these rock formations are known as the Shark fins. 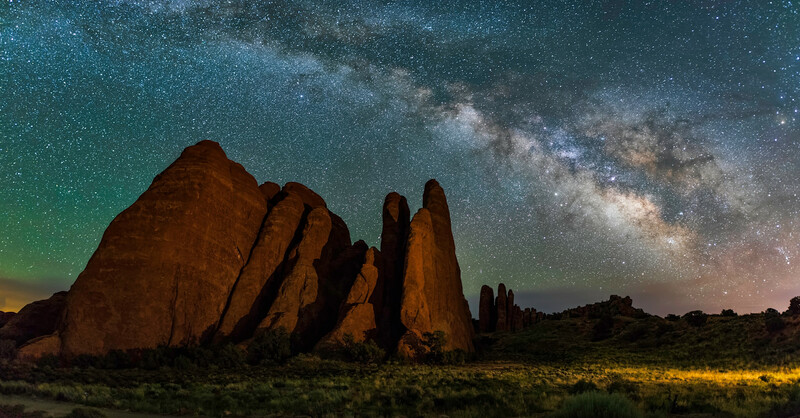 In spring, the Milky Way forms a perfect arch above the fins. To capture this shot, we arrived before sunset and then waited for the stars to reveal themselves. The Milky Way appeared over the horizon around 1:30 a.m. Despite the relatively bright night sky, we also chose to illuminate the Shark Fins with a supplemental, low-power light.